We’d love your help. Let us know what’s wrong with this preview of Tracy Tam by Krystalyn Drown. To ask other readers questions about Tracy Tam, please sign up. This is an adorable story and took me back to my childhood when i would stay up late and see if could catch Santa. I totally loved how Tracy has the best intentions on why she wants to figure Santa out and how all the neat little details their are in the story. This was a cute story that all adults and children will enjoy reading if you love Santa stories. Ten year old Tracy Tam is very studious. She’s out to prove that Santa doesn’t exist and she almost does. What!!?? Oh, bah humbug – I’m not out to destroy children’s dreams of Santa magic and neither is this book. But, kids may be biting their nails for a while to see how the story unfolds. Tracy has all good intentions. Her cousin needs a very expensive operation that her parents can’t afford. If Tracy can provide scientific proof of Santa — or his non-existence — and win the grand prize from t Ten year old Tracy Tam is very studious. She’s out to prove that Santa doesn’t exist and she almost does. What!!?? Oh, bah humbug – I’m not out to destroy children’s dreams of Santa magic and neither is this book. But, kids may be biting their nails for a while to see how the story unfolds. Tracy has all good intentions. Her cousin needs a very expensive operation that her parents can’t afford. If Tracy can provide scientific proof of Santa — or his non-existence — and win the grand prize from the State Science Fair, she can help her cousin to get the operation. Along the way, Tracy encounters an almost zombie-like Santa Claus, evil elves, and a North Pole with no snow. And, where are the reindeer, for Pete’s sake? She’s very observant and gathers a lot of ‘proof’. Then she meets two adults at Santa Command who decide they will either need to wipe her mind clean (gasp! ), or work with her to help her understand their mission. Phil is the Santa Command computer ‘techie’ and Beth manages the children’s wish lists. While they are in the hall being admonished by their boss, Tracy downloads some files from the computer – and now, it’s broken! This was a very enjoyable read, even for an adult. The recommended age range is 9 – 12 (grade level 3 – 7). I loved that the author weaved in a few surprises and magic. Nothing is quite like it seems. All of the characters were remarkably fun – except for maybe the zombie-like Santa Claus. I rated Tracy Tam: Santa Command at 4 out of 5. Ten-year-old Tracy Tam has a hypothesis, based on the slogan of the Santa Commission: “Even magic needs a helping hand.” But her hypothesis is that there’s no such thing as magic at all, only science that is disguised or undiscovered. That’s why she sets out on Christmas Eve to gather evidence for the science behind Santa Claus – that and the little matter of a state science fair with enough prize money to pay for her cousin’s desperately needed operation. But what starts as a science experiment Ten-year-old Tracy Tam has a hypothesis, based on the slogan of the Santa Commission: “Even magic needs a helping hand.” But her hypothesis is that there’s no such thing as magic at all, only science that is disguised or undiscovered. That’s why she sets out on Christmas Eve to gather evidence for the science behind Santa Claus – that and the little matter of a state science fair with enough prize money to pay for her cousin’s desperately needed operation. But what starts as a science experiment gets wildly out of hand. Why does Santa behave like a mindless zombie? What are the reindeer REALLY? And when Tracy’s unauthorized trip in Santa’s sleigh ends with her being chased off a rooftop by wolves, her “science experiment” puts all of Christmas in jeopardy. One of the things I really enjoyed about this book is how scientific principles are employed in an engaging story, while still allowing for the possibility of magic. TRACY TAM SANTA COMMAND by Krystalyn Drown turns everything you thought you knew about Christmas on its head—the reluctant reader will enjoy nail-bitter page turns, while the reluctant believer gets an exciting Chirstmas escapade. Tracy Tam may believe in Santa, but she’s a reluctant believer in his magic. She’s certain everything has a scientific explanation—even Christmas, so on December 24th she sets out to gather evidence, samples and data to prove the science behind Christmas. If she’s succe TRACY TAM SANTA COMMAND by Krystalyn Drown turns everything you thought you knew about Christmas on its head—the reluctant reader will enjoy nail-bitter page turns, while the reluctant believer gets an exciting Chirstmas escapade. Tracy Tam may believe in Santa, but she’s a reluctant believer in his magic. She’s certain everything has a scientific explanation—even Christmas, so on December 24th she sets out to gather evidence, samples and data to prove the science behind Christmas. If she’s successful, she’ll use the evidence to present at the state Science Fair competition and hopefully win the cash prize. And Tracy desperately wants that prize money, so she can give it to her aunt to pay for her cousin Pim’s expensive operation. Tracy will do anything to help Pim, including hiding in Santa sleigh and hitching a ride back to Santa’s workshop. But the workers at Santa Command will do anything to protect the secret of Christmas magic. And so here’s where everything —as promised—is turned on its head—but I won’t ruin the discovery of those secrets here. What I will tell you is the story is packed with fun surprises and zany flips that turn expectations into wonder. Young readers will have a fun adventure reading this story as they wait for their own visit from Santa. 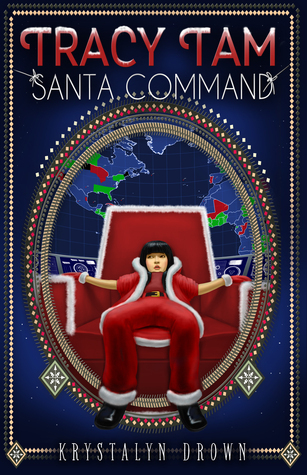 Tracy Tam keeps readers as well as everyone at Santa Command on their toes. This was a short and sweet middle grade story that is bursting with Christmas spirit. The main character, Tracy Tam, is a logical girl who not only believes that Santa isn't real--she's going to prove it and make enough money to help her cousin with an operation. But when Tracy sneaks into the back of Santa's sleigh, she finds that the North Pole isn't what she expected and nothing is what it seems. I thought Tracy was a smart, tough girl who was clever but was so single minded she couldn't see th This was a short and sweet middle grade story that is bursting with Christmas spirit. I thought Tracy was a smart, tough girl who was clever but was so single minded she couldn't see the mistakes she was making. She did come to her senses though, and realizes how she may have been hurting others even when she was trying so hard to help someone she loved. The Santa mythos is given a cool, unique twist in this book, and that is pretty hard to do. I enjoyed hearing about the original Santa's backstory and all the magic surrounding him and Christmas. Her various other day jobs have included working at Sea World in zoology, as an elementary teacher, and currently as a support technician for a web Krystalyn has spent the past thirteen years working at Walt Disney World in a variety of roles: entertainer, talent coordinator, and character captain. Her degree in theatre as well as many, many hours spent in a dance studio, helped with her job there.